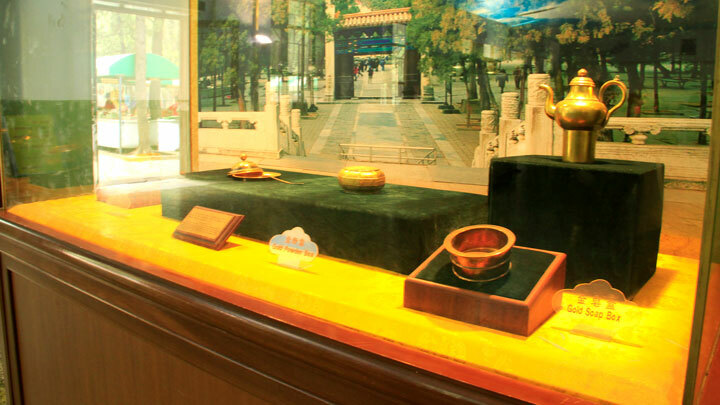 In Brief: Hike a hill trail in the mountains that form the feng shui barrier for the Ming Tombs; go underground at Ding Tomb, one of the largest of the thirteen Ming Tombs. A view from the high point of the hike. On this hike we'll climb an old hill trail in the mountains that form the feng shui barrier on the north side of the Ming Tombs in Changping District. 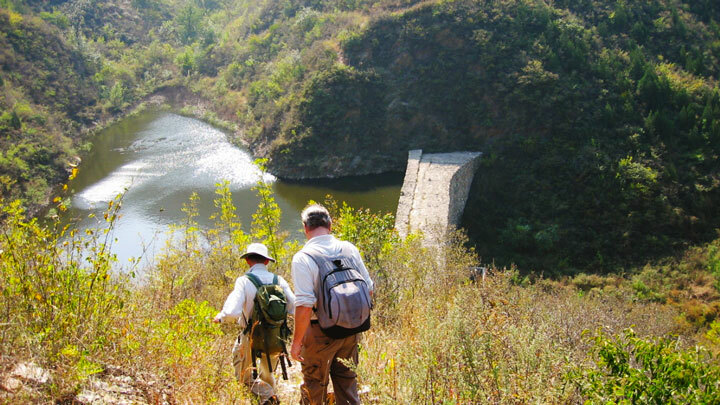 The hill trail leads over the mountains, up to a lookout, out a valley past a small reservoir, and then on towards the tombs. The first part of the trail doesn't see much use and parts of it get a little overgrown and bushy, but after we get to the first ridge it all opens up. During summer, we recommend wearing trousers and a long sleeved shirt to prevent scratches. 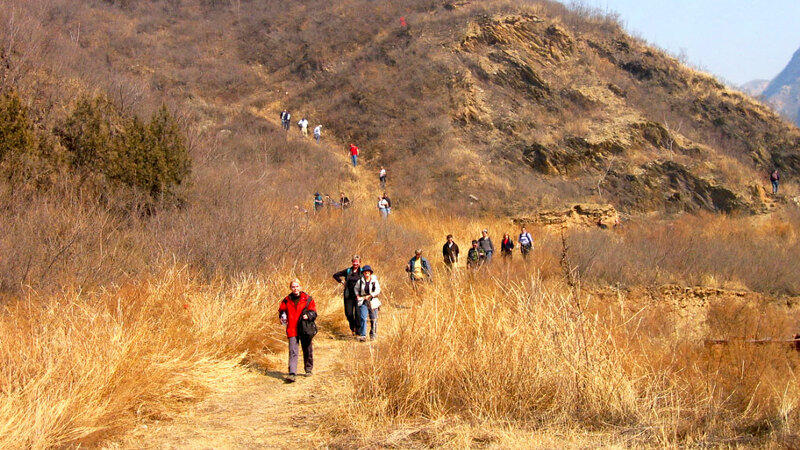 The trail leads up to a ridge, and then on to a peak where we’ll stop for a rest, and enjoy the panoramic views of the Ming Tombs area. 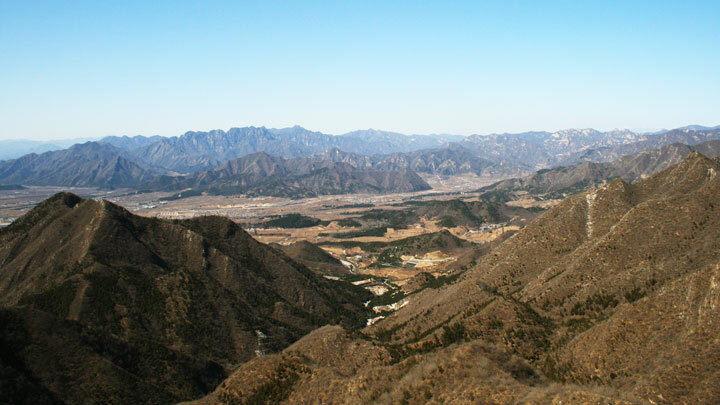 On a clear day we can see quite a few of the tombs and how they are positioned in accordance with principles of feng shui. From the top we can see two of the tombs that are not open to the public, and, depending on the weather, some of the other tombs may also be sighted. Our path down from the ridges leads towards them, following the valley down past a small reservoir, orchards, and some alert dogs. 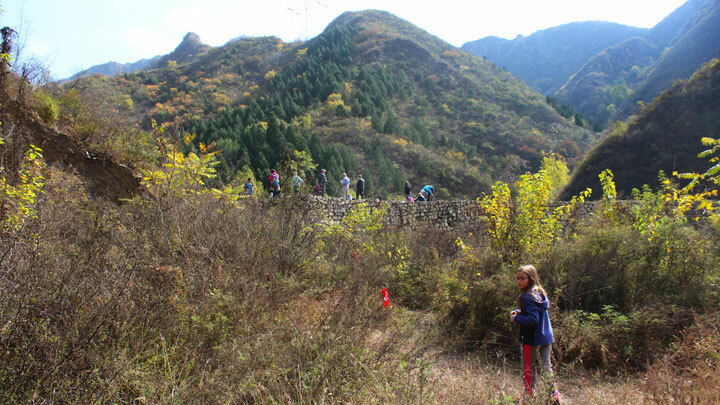 Once we’re back on flat land we will walk past the two tombs that were visible from the peak. 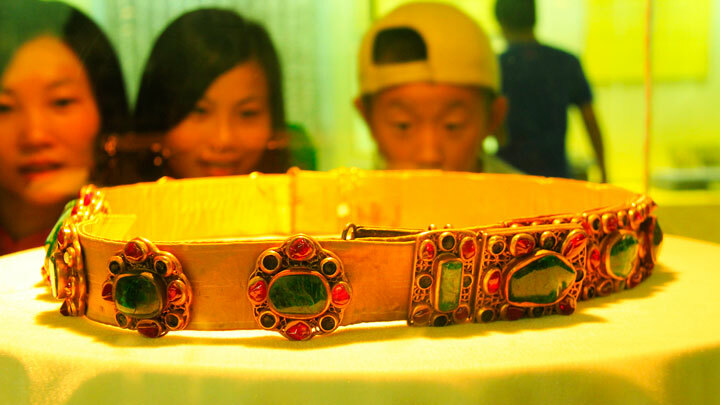 After we’ve finished the walk around the tombs, we’ll head to a local restaurant for a big lunch, and after lunch we’ll take a short drive to Ding Tomb for a tour. 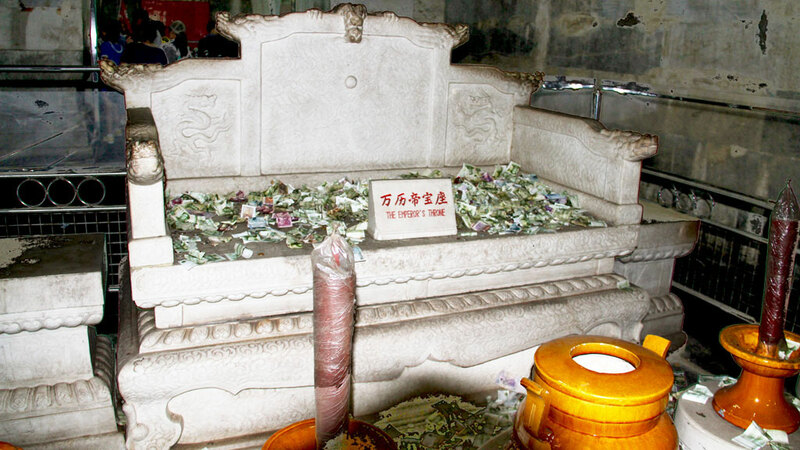 Dingling is the tomb of the Wanli Emperor, Zhu Yijun, who reigned from 1573 until 1620. 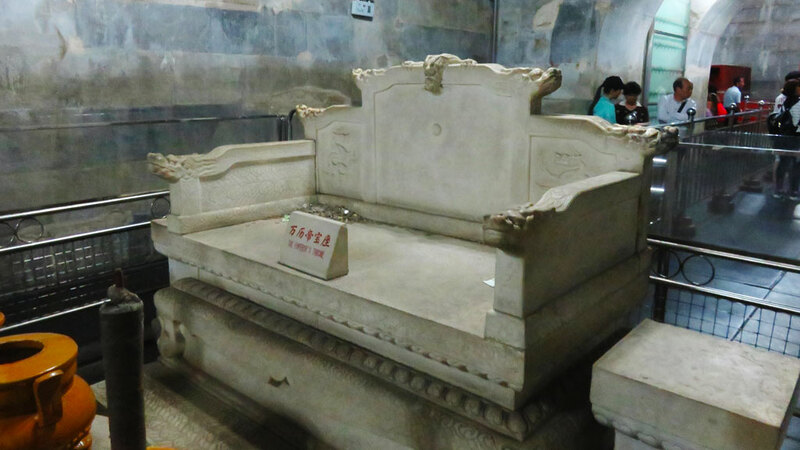 His tomb is one of the largest in the Ming Tombs area. The highlight of the tomb complex is definitely the 'Underground Palace' where he was entombed, 27 metres underground. 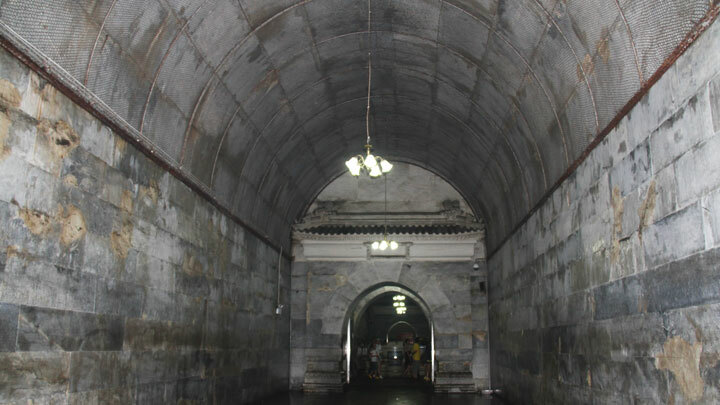 We’ll explore the grounds of the tomb before heading underground. 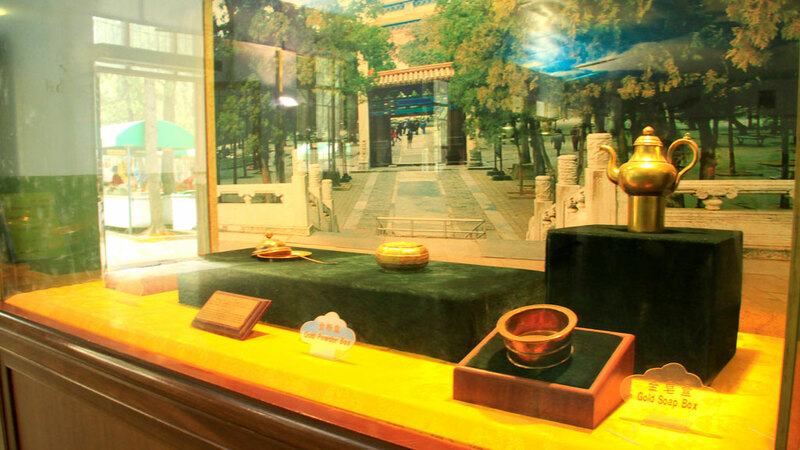 As well as big halls and towers, old trees and gates, and, of course, big red walls, there is a small museum that contains replicas of some of the treasures found when the tomb was excavated. The middle section of the trail may be a little brushy and scratchy. After a walk through the hills north of the Ming Tombs area we visited Ding Tomb for a look about—see 10 photos from the hike and the tomb. 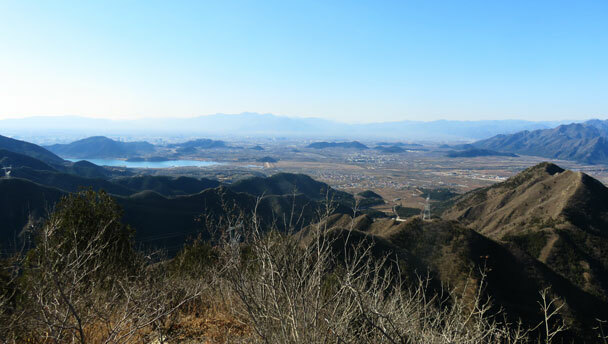 Photos from our day out in Changping, where we hiked around the hills and finished up with a stroll down the Sacred Way.